Global intensification of food production has led to the generation of large quantities of food waste residues. With the current food economy and the future state of global natural resources and quality of the environment at stake, there has been a worldwide trend to implement the idea of sustainable development that puts emphasis on waste management. In order to reduce the mass of agro-industrial wastes, international organizations such as the United Nations and current legislation throughout the world have begun to strongly encourage the food industry to find new end uses for residues (European Union 2012; United Nations 2015; RedCorn et al. 2018). The residues of fruit and vegetable industrial processing have been widely used for animal feed or as a source of energy, but it is believed that still too few residues are used in other applications e.g., in the food industry. The high nutritional and health-promoting value and presence of active compounds such as antioxidants should favour this area of re-use or recovery (Kowalska et al. 2017). Potatoes are one of the most commonly consumed crops in the world, which is connected with their impact on residue generation. The disposal of this waste poses a challenge. Potato peels constitute a major waste of potato processing that ranges from 15 to 40% of the initial product’s mass; therefore, their valorization should be of interest to the food industry (Akyol et al. 2016; Gebrechristos and Chen 2018). The periderm (skin) of the potato provides a protective layer for the potato tuber against phytopathogens and therefore contains numerous secondary metabolites, including phenolic compounds (Ezekiel et al. 2013; Huang et al. 2017). Phenolic antioxidants such as hydroxycinnamic and hydroxybenzoic acid derivatives and flavonoids have been found in the extracts of potato peel (Al-Weshahy and Rao 2009; Deußer et al. 2012). In accordance with the growing antipathy of consumers towards synthetic food additives, potato peels seem to constitute a potential source of natural antioxidants that can be used in the food industry (Carocho et al. 2018). Natural antioxidants have been the focus of scientists and food business operators’ for many years. These compounds show similar or even higher potential than their synthetic counterparts, which makes them an attractive alternative to artificial agents (Sielicka and Małecka 2016; Özkan and Özcan 2017). The ubiquity of their occurrence in plants, as well as the great number of active compounds, creates the potential for extending the list of antioxidants feasible to use in food. Although the method of obtaining a given chemical does not prejudge its toxicity, synthetic compounds are disliked by consumers. In contrast to synthetic food additives, which are regarded as ‘unhealthy’ and provoke controversy, natural compounds are better perceived by consumers. Producers who are aware of consumers’ attitudes avoid using them in food, replacing synthetic antioxidants with widely accepted compounds of natural origin (Carocho et al. 2018). The recovery of natural antioxidants from plant material residues such as pomaces, kernels, skins and peels in order to extend the shelf life of lipid-containing foods is in line with sustainable management policy and consumers’ expectations. 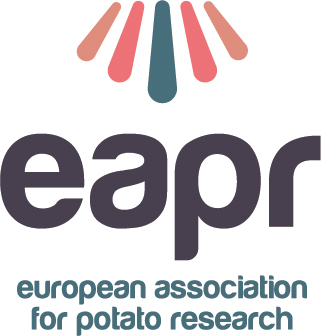 The properties of potato peel extracts have been tested in in vitro antioxidant assays, but the data remain scarce and concern only selected cultivars out of over 300 described so far (AHDP Potatoes 2018). Moreover, still too few studies have been conducted on the potato peel’s effectiveness in lipid matrices in the context of selective effect of antioxidants in different media and differentiated activity towards primary and secondary oxidation products (Frankel 2007). With possible new applications for potato peels such as in innovative food products or as a source of natural antioxidants used to stabilize food lipids, recognizing the factors influencing their properties is a key issue to be tackled. More studies are necessary in order to understand the mechanisms that determine the antioxidant power of potato peel extracts in order to effectively use their potential. The aim of the present work was to assess the potential of six potato peel extracts by using antioxidant assays as well as model systems that contained food lipids. Samples of two cultivars of potato (Solanum tuberosum), Gala (G) and Jazzy (J), originating from a local potato supplier were used. Samples of refined rapeseed and sunflower oil were purchased in retail trade. 2,2-diphenyl-1-picrylhydrazyl (DPPH), Folin-Ciocalteu reagent, gallic acid, β-carotene, butylated hydroxyanisole (BHA), butylated hydroxytoluene (BHT), 3-(2-pyridyl)-5,6-diphenyl-1,2,4-triazine-p,p′-disulfonic acid monosodium salt hydrate (ferrozine), linoleic acid, hexanal, nonanal, Tween 40 and sodium methanolate were purchased from Aldrich (Germany). Fatty acids methyl esters (FAME) Mix 37 certified reference material was purchased from Supelco. Potassium iodine was from Stanlab (Poland) and other reagents were from POCh (Poland). The skin of potato tubers was removed using a vegetable peeler. The peels were dried at 60 °C in a laboratory oven and milled to a fine powder. The material was extracted three times overnight at 5 °C with one of the following solvents: 96% ethanol (E96), 80% ethanol (E80) and water (W) (Farvin Habeebullah Koduvayour et al. 2010. The extracts were lyophilized and kept at − 20 °C until further use and then dissolved in 96% ethanol to prepare the model systems. Extracts in initial solvents, 96% ethanol (E96), 80% ethanol (E80) and water (W), were applied in other tests. TPCs were determined with Folin-Ciocalteu reagent (Singleton and Rossi 1965). The principle of this methods involves the reaction of phenolic compounds with Folin-Ciocalteu reagent under basic conditions. The method measures the reducing capacity of the sample. Electron-transfer reaction occurs between reductans and Mo(VI) leading to formation of the blue complex which does not depend on the structure of phenolics (Huang et al. 2005). The primary components of the reaction mixture were as follows: water (5 mL), Folin-Ciocalteu reagent (0.5 mL) and diluted potato extract (0.4 mL). The mixture was left for 3 min and then 20% sodium carbonate (1.5 mL) was added. The volume was filled up with water to 10 mL. After 2 h, the absorbance was measured at the wavelength λ = 725 nm using a Genesys 6 UV–Vis (Milton Roy) spectrophotometer. For the preparation of the calibration curve, solutions of gallic acids (0–500 mg/L) were used instead of the extract. The results were reported as mg of gallic acid (GA)/g DW (dry weight) of the extract. The absorbance measurements were carried out for 25 min at 5-min intervals. On the basis of the observed kinetics, t = 10 min was selected to calculate the antiradical capacity. The reducing power assay was based on the measurement of the antioxidant potential of compounds which act as electron donors and show ability to break the free radical chain through converting free radicals to stable products (Amarowicz et al. 2000). According to the method of Oyaizu (1986), a total of 1 mL of diluted potato extract was mixed with 1 mL of 0.2 M phosphate buffer (pH 6.6) and 1% potassium ferricyanide (1 mL). The mixture was held at 50 °C (20 min), then 10% trichloroacetic acid (TCA) was added (1 mL). Deionized water (2 mL) and 0.1% FeCl3 (0.4 mL) were pipetted into 2 mL of clear solution. Finally, the absorbance was measured at λ = 700 nm with the use of the Genesys 6 UV–Vis (Milton Roy) spectrophotometer. Increased absorbance of the reaction mixture with extracts added was the measure of their reducing power. where A0 is the absorbance at time = 0 min, A120 is the absorbance at time = 120 min. Fatty acid methyl esters (FAME) were prepared with hexane (1 mL) used as solvent of the rapeseed and sunflower oils (about 0.2 mL). Then 1 mL of 0.4 N sodium methylate was added (Schulte and Weber 1989). After addition of water, the upper layer was analysed with the use of an Agilent 7820A gas chromatograph equipped with a flame-ionization detector and a BPX-70 column (SGE, 60 m × 0.25 mm, 0.25 μm), with oven working in a programmed mode: 140 °C (5 min) raised to 240 °C (6 °C/min). The temperatures of the injector and detector were 250 and 270 °C, split ratio was 1:50 (Klensporf-Pawlik et al. 2018). Helium was the carrier gas. The basis for FAME identification was a certified standard mixture. The results were expressed as a percentage fraction of total fatty acids. Potato peel extracts dissolved in ethanol were added to samples of rapeseed (RO) and sunflower (SO) oil in concentrations of 200 and 500 ppm (based on the extracts’ dry weight). Ethanol was removed by extended flushing with argon. Synthetic antioxidants BHA and BHT were used (200 ppm) for comparison. Samples without added antioxidants served as the controls. Ten-millilitre portions of such prepared model systems were placed in glass vials (22 mL), closed and stored at 50 °C under dark conditions. The method is based on the measurement of UV light absorption by conjugated fatty acids (conjugated dienes). Their formation is a result of a shift in the position of the double bond which accompanies production of radicals of polyunsaturated fatty acids. The presence of conjugated dienes can be measured spectrophotometrically. The results were expressed in μmol/g of oil. Volatile compounds are the secondary oxidation products resulting from decomposition of hydroperoxides. They were determined after 0, 9, 15 and 21 days (rapeseed oil) and 0, 3, 6 and 9 days (sunflower oil) of storage at 50 °C by static headspace gas chromatography analysis (SHS-GC) using Agilent 7820A gas chromatograph coupled with Agilent 7697A headspace autosampler. The headspace fraction was injected into a CP Sil 8CB (Varian, 30 m × 0.53 mm × 1.5 μm), working in the mode 40 °C (2 min), raised to 100 °C (8 °C/min) and then to 200 °C (20 °C /min, 5.5 min) (Samotyja and Małecka 2010). The temperature of flame-ionization detector was 220 °C. Helium was the carrier gas. Standards of hexanal, nonanal and 2,4-decadienal (Aldrich, Germany) were used for identification and quantification purposes. All data represent mean values ± standard deviation (SD). Statistical analysis was based on one-way analysis of variance. The post-hoc Tukey HSD procedure was applied to establish significant differences among the means (P < 0.05). Statistica software ver. 12.0 (StatSoft) was used for analysis. Both the composition and the properties of extracts from plant materials are influenced by the solvent used and by differences in the polarity of compounds present in the plants. In the present study, three solvents were used of which water allowed a higher amount of DW to be extracted, giving a yield of 21.7% for Jazzy peels and 17.8% for Gala peels. Moderate yields were obtained with 80% ethanol (J – 11.4%, G – 9.9%) and low yields with 96% ethanol (2.1% in both cases). Solvents such as methanol, ethanol, acetone, ethyl acetate, hexane, diethyl and petroleum ethers have been used to extract phenolics from potato peels, sometimes with different proportions of water (Mohdaly et al. 2010b; Singh and Saldaña 2011). Mohdaly et al. (2010b), who carried out the extraction of cultivar Diamond peels with six organic solvents, stated that the use of either methanol or ethanol gave a higher yield. The polarity of the solvent affects the amount and rate of polyphenols extracted; for example, methanol has generally been found to be more efficient in the extraction of lower molecular weight polyphenols, while those with higher molecular weight are better extracted with aqueous acetone. Generally, ethanol is considered to be a good solvent for polyphenol extraction and is safe for human consumption (Dai and Mumper 2010). The amount of TPC in potato peel extracts ranged from 10.1 to 40.5 mg/g of DW of crude extract and depended both on the solvent used for extraction and on the cultivar of potato (Fig. 1). Despite the fact that water was the most powerful extracting solvent, 1 g of water extracts had the lowest TPC. Extracts obtained with 96% ethanol exhibited the highest amount of phenolics. Within the same type of solvent, Jazzy extracts contained more phenolics than Gala extracts. Differences resulting from the cultivar of potato as well as the extraction method have been reported in the literature (Farvin Habeebullah Koduvayour et al. 2010; Dai and Mumper 2010). The TPCs assessed in extracts obtained by Friedman et al. (2017) with the use of 80% methanol from six cultivars of potato peels ranged from 11.3 to 34.4 mg/g. 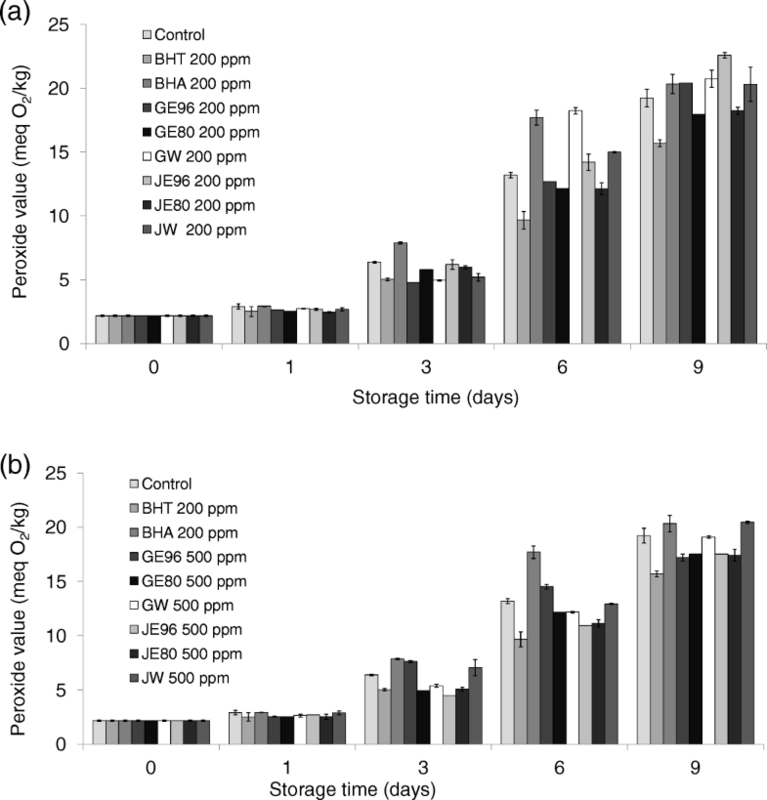 The levels of total phenolics in methanolic extracts of 60 cultivars of potato grown in Ireland varied considerably and ranged from 1.56 to 12.59 mg/g (Valcarcel et al. 2015). Phenolic acids (chlorogenic, caffeic, p-coumaric and ferulic acid), flavonoids and flavonols have been the most often investigated antioxidants of potato peels (Mohdaly et al. 2010b; Tasahil et al. 2013; Visvanathan et al. 2016). Figure 2 shows the antioxidant properties of potato peel extracts as a function of their concentration. The results of the in vitro assays proved high antioxidant activity of extracts of cultivars Gala and Jazzy. The DPPH assay showed that potato peel extracts in 96% ethanol were better radical scavengers than in 80% ethanol, with the Jazzy extract showing better properties than the Gala extracts (Fig. 2a). Antiradical capacity increased along with the concentration, but the relation was not linear. The addition of water extracts to the DPPH solution caused analytical problems (the DPPH radical does not dissolve in water) so they were excluded from this assay. The reducing power of the potato peel extracts increased along with an increase in their concentration (Fig. 2b). 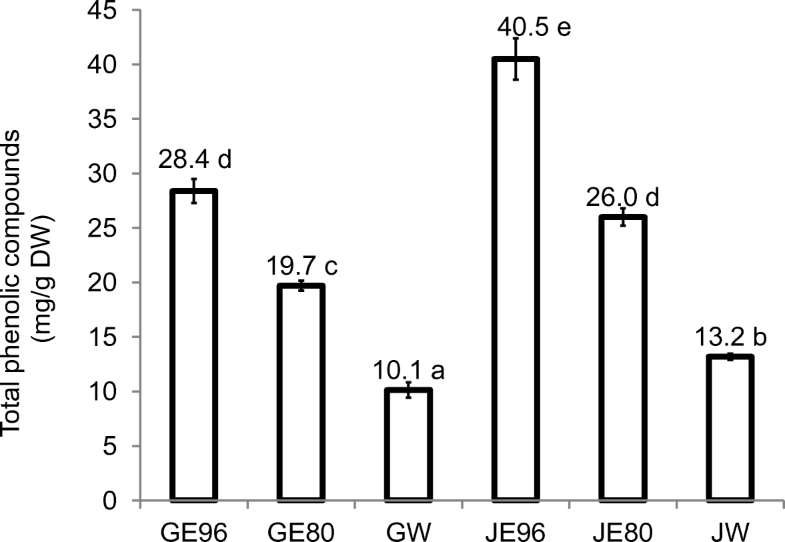 The order of the reducing power was JE96 > GE96 > JE80 > GE80 > JW > GW and was unchanged, irrespective of the concentration of the extracts. The reducing properties of antioxidants play a crucial role in the termination reaction due to which the radical chain reaction can be interrupted (Frankel 2007). On the other hand, transition metals can react with hydroperoxides, resulting in their decomposition and in generation of reactive oxygen species. This decomposition occurs via redox reactions in which both Fe2+ or Fe3+ ions can be involved, although some authors have stated that metal ions in their lower valence state are more active (Gordon 2003). These processes can explain the pro-oxidant effect of some antioxidants in foods and biological systems (Frankel 2007). In this context, besides considering the reducing power, the simultaneous role of chelating antioxidants in the binding of heavy metals into inactive compounds seems to be crucial when considering antioxidant potential. Iron (Fe2+)-chelating agents also play an important role in preventing hydroxyl radical (∙OH) formation in Fenton reactions in which Fe 2+ ions are involved (Frankel 2007). Farvin Habeebullah Koduvayour et al. (2010) reported a higher reducing power of ethanolic extracts, but the order was reversed when testing the iron-chelating activity of cultivar Bintje and cultivar Sava potato peel extracts. In the present study, the order of the chelating activity of potato extracts was JE96 > GE96 > JE80 > GE80 > JW > GW (Fig. 2c) and was the same as in the reducing assay. These results may suggest the synergic effect of both mechanisms in suppressing the oxidative action of iron ions. In the subsequent assay, β-carotene bleaching by hydroperoxide-derived free radicals resulting from linoleic acid oxidation was assessed (Fig. 2d). A higher concentration of the extracts resulted in higher inhibition of coupled oxidation but, similarly to previous tests, this dependence was not linear. Contradictory to previous tests, the concentration of extracts used in this assay strongly influenced the order of their relative effectiveness: in low concentrations the water extracts poorly inhibited β-carotene degradation, whereas increased activity was observed along with an increase in their concentrations. The Gala extracts showed higher ability than the Jazzy extracts in inhibiting degradation of β-carotene, contradictory to what had been found in previous tests. The activity observed in the β-carotene bleaching assay suggests that the studied extracts can act as primary antioxidants in food lipid media, thus contributing to breaking free radical chains. The antioxidant properties of Gala and Jazzy potato peel extracts were examined in model lipid systems. The first model’s lipid medium was rapeseed oil (RO), in which the predominant fatty acids were 16:0 (4.4%), 18:0 (1.8%), 18:1 (61.4%), 18:2 (20.0%) and 18:3 n-3 (8.7%). The second model system consisted of sunflower oil (SO), in which the predominant fatty acids were 16:0 (6.4%), 18:0 (3.3%), 18:1 (27.8%) and 18:2 (61.0%). In order to evaluate the extracts’ antioxidant properties, their influence on the oxidative stability of lipid matrices was investigated. The course of oxidation was assessed based on measuring the formation of primary and secondary oxidation products. The peroxide value (PV) is a measure of the concentration of hydroperoxides i.e., primary compounds that are formed during the initial stages of oxidation. 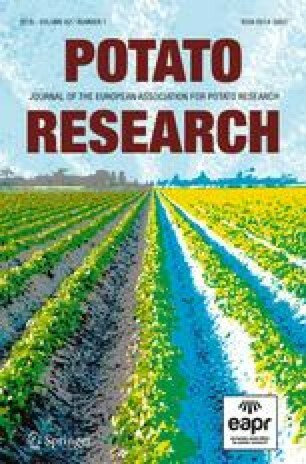 The influence of potato peel extracts on the formation of hydroperoxides in rapeseed oil is presented in Fig. 3. A continuous increase in PV during the storage period was observed in all of the samples, thus showing progressive autoxidation. Potato peel extracts of both cultivar Gala and Jazzy inhibited the formation of hydroperoxides in rapeseed oil, thus showing higher efficiency than the synthetic antioxidants BHT and BHA. Oxidative changes were delayed to the highest degree by the extracts in 80% ethanol. The results showed that extracts used in a concentration of 500 ppm acted for a longer period of time than those in a concentration of 200 ppm. The potato peel extracts also slowed down the formation of conjugated diene hydroperoxides in rapeseed oil (Table 1). The levels of CDs in samples with extracts were lower than in the control sample during the entire period of the experiment. The results presented here prove the high antioxidant efficiency of potato peel extracts in delaying primary oxidative processes in rapeseed oil. In sunflower oil, moderate activity of ethanolic extracts was observed against the formation of hydroperoxides (Fig. 4). Similar to results of β-carotene assay, increased activity of water extracts was observed along with an increase in their concentrations. The best antioxidant in sunflower oil was the synthetic compound BHT, but rather slightly different results were found in the case of CD formation (Table 2). All of the extracts used here showed high efficiency in delaying diene formation. Conjugated diene hydroperoxides are formed from polyunsaturated fatty acids, so their inhibition in sunflower oil, which contains over 60% linoleic acid, does not seem to be negligible. Mohdaly et al. (2010a) investigated the antioxidative potential of methanolic potato peel extracts from cultivar Diamond in both sunflower and soybean oil at concentrations ranging from 5 to 200 ppm. All of the concentrations effectively delayed hydroperoxide and diene formation, thus showing better potential than BHT at a level of 200 ppm. Their activity was lower in comparison with the action of tert-butylhydroquinone (TBHQ) in the same concentration (Mohdaly et al. 2010a). Franco et al. (2016), who studied the effect of ethanolic potato peel extracts from cultivar Agria on the oxidative stability of soybean oil, also proved their efficiency in delaying hydroperoxide and conjugated diene formation. 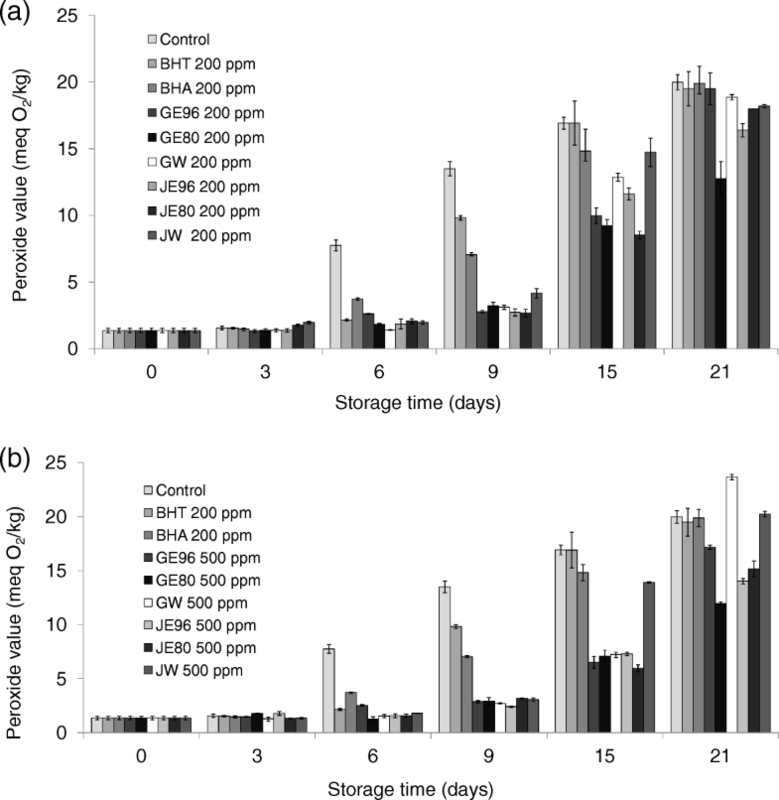 The efficiency of both Gala and Jazzy potato peel extracts in delaying the decomposition of primary oxidation products in plant oils was assessed using the analysis of volatile compounds formed during storage under accelerated storage conditions. The extracts were used at a concentration of 500 ppm. The most common volatile marker of oxidation is hexanal, which is a product of linoleic acid oxidative decomposition. Because of its low flavour threshold (0.08–0.6 ppm), its presence in food is monitored and used as an index of quality and as a measure of oxidative rancidity (Gordon 2003; Azarbad and Jeleń 2015). All of the applied extracts markedly inhibited hexanal formation when compared to the control (Fig. 5). As the experiment was conducted beyond acceptable values of PV of 10 meq O2/kg for refined oils (Codex Standard 2015), the results obtained here that pertain to volatile formation are promising regards using potato peel to prolong the shelf life of food. 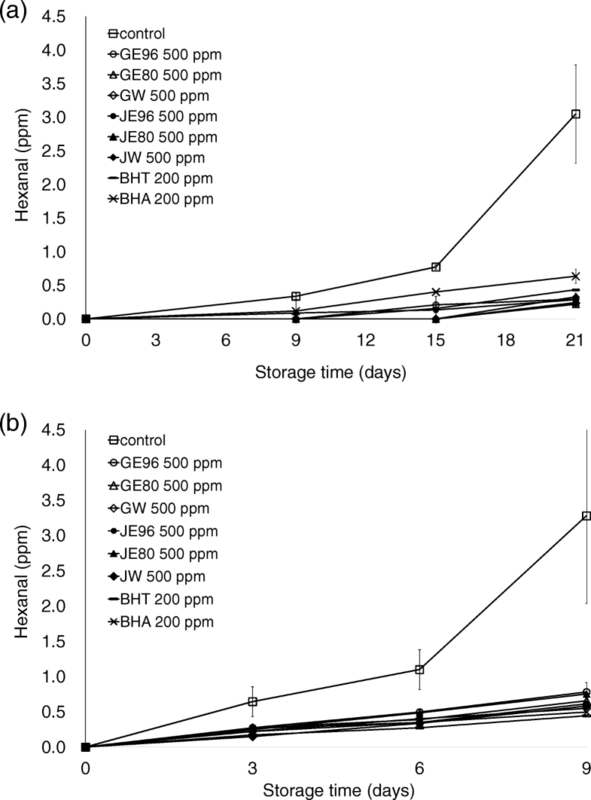 Nonanal, a cleavage product from oleate hydroperoxides, was found on the last day of storage only in the control samples of rapeseed (3.0 ppm) and sunflower oil (1.9 ppm) and in rapeseed oil stabilized by GE96 (1.1 ppm) and JE96 (1.2 ppm) (data not presented); 2,4-decadienal was not detected. The studies of other authors found good protection of soybean and sunflower oil by potato peel extracts from cultivars Diamond and Agria against secondary oxidative changes (Mohdaly et al. 2010a; Franco et al. 2016). The plant extracts’ activity in food lipids towards inhibition of primary oxidative changes does not always go in line with that of secondary oxidative changes (Samotyja and Małecka 2010). The results obtained in this study provide important information on the properties of both cultivar Gala and Jazzy potato peel extracts, as these are not only able to delay primary oxidative changes in food lipids but also have a positive effect on retarding oxidative rancidity which is connected with the formation of volatile aldehydes. Potato peel extracts are a source of antioxidants that show high potential. The antioxidant activity observed in this study using in vitro tests was confirmed in food lipids. The results of protective action vary according to the lipid matrix, which proves the complexity of interactions between antioxidants and the lipid medium. The observed inhibitive effect against primary oxidation product formation and their degradation is a result of multiple effects. Ethanolic extracts exhibited better antiradical, reducing and chelating activity than water extracts. They also showed higher activity in rapeseed and sunflower oil. 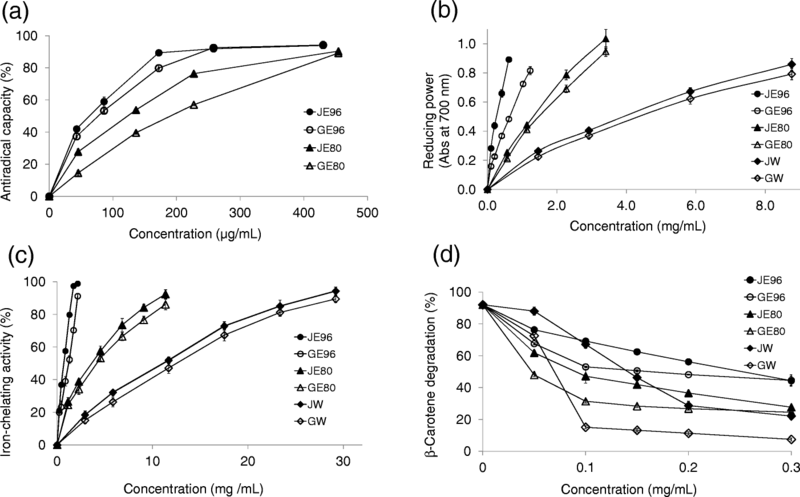 In the inhibition of β-carotene degradation induced by linoleic acid oxidation, the extracts’ relative effectiveness depended on their concentration. Further studies are necessary to explore interactions of potato peel extracts in more complex lipid matrices that constitute various food products. It is worth noticing that the activity of potato peel extracts is comparable or even better than the activity of synthetic compounds, and further studies will help contribute to the revalorization of these agri-food residues in the global food industry. I acknowledge with thanks the advice and kind help of Dr. (Mrs.) D. Klensporf-Pawlik. Also, National Science Centre (Narodowe Centrum Nauki), Poland, [grant number 2017/01/X/NZ9/00399] is greatly appreciated. This work was supported by the National Science Centre (Narodowe Centrum Nauki), Poland [grant number 2017/01/X/NZ9/00399].